I’m heading off to a friends house for the evening. After a heavy sigh I think I should get out of the costume I’ve worn all day and put on some big girl pants. Then I think, nah … Love me love my leggings. 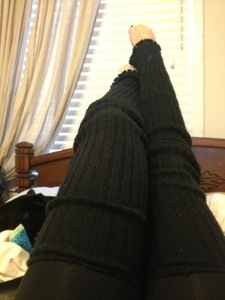 If wearing thigh high sparkly leg warmers is wrong I don’t want to be right! Those are so full of win. You can wear them in my portland house.